Half a century ago, the United States turned Laos into history’s most heavily bombed country, raining down some two million tons of ordnance in a covert, nine-year chapter of the Vietnam War. 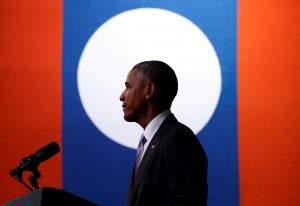 Obama the first president to set foot in Laos while in office, lamented that many Americans remain unaware of the “painful legacy” left behind by a bombardment that claims lives and limbs to this day. “We’re incredibly proud of the progress the sector has made over the last five years in terms of the decline in casualties and new victims,” said Channapha Khamvongsa of the nonprofit Legacies of War. “But we are concerned about the upwards of 15,000 survivors around the country that are still in need of support.” Obama announced the U.S. would double its spending on bomb-clearing efforts — a significant investment for a small country in one of the poorer corners of the world. The $90 million to clean up bombs joins another $100 million the U.S. has committed in the past 20 years. The Lao government, meanwhile, says it will boost efforts to recover remains and account for Americans missing since the war. Daniel Malloy in Luang Prabang, Laos, contributed to this report.